Pale Ale meets sour. God I’m tired of these hybrid beers – conceptually they promise much, but in reality it’s just a car crash. That said, it is hard to achieve decent balance in sour beers, and Holgate otherwise make great stuff. Lactobacillus gives this brew it’s tang funk, but I’m curious whether there might be some Brett in there too. Whatever, this definitely has an ‘earthen’ edge, which seems like a mismatch to the otherwise clean and refreshing pale ale base. It’s like someone threw up a nice beer. Nup. 1.5 stars. 4.5%. Would I buy again? Nope. I feel like you might be a little bit hard on this one, You don’t like hybrid beers but do a lot of write ups on IPA Hybrids. I 100% get that this beer isn’t for everyone nor are Sour beers in general but it shows balance has good malt, fresh hops and a sour finish. It’s a great foodie beer I just don’t think it’s fair to write down a style because it’s not for you. Hence why I don’t talk about Kolsch as it’s not for me I have seen great examples of the ol Wicked Elf Kolsch was a technically perfect Kolsch I just don’t like them. Judge it on what it is not because you would prefer to drink IPA. PS I really do like reading your reviews as well. I hear exactly what you’re saying Daniel. 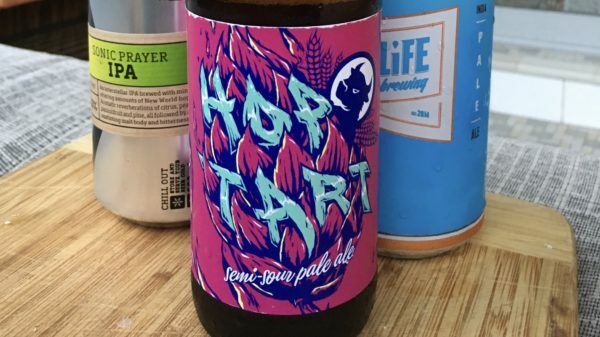 My gripe with sours is that mostly the sourness just doesn’t quite fit – the balance just isn’t right, much the same with plenty of IIPAs for that matter. I’ll stick my hand up for the sours from La Sirene as examples of how it can work. Again, that is because the sour feels balanced. Further, I find the use of excess lactic acid bacteria in many sours as a turn off (same with brett) as they’re such dominant, singular flavours – and hence unbalanced. Hey and I don’t just love IPA – I love many colours of the beer rainbow!